Over the last 6 years we have formed a tremendous partnership with FORTUNE magazine and the teams that build and manage their live events. We call all over the World to talk with senior executives of global businesses to persuade them that an investment of their time and money in attending FORTUNE’s events will bring sound returns. This goes way beyond just driving delegate numbers. FORTUNE is one of the pre-eminent business brands and they need to be sure that with every touch point with prospects that brand is not only secure, but enhanced – that’s why they choose Broadley Speaking. Right now it is great to be working on the 2019 edition of Brainstorm Design. Broadley Speaking played a formative role in making the inaugural edition in 2018 a huge success. The event promoted by both FORTUNE and Wallpaper* magazine looks in detail at the impact design should have on business. The world’s leading businesses are discovering the transformative power of design as a vital element of corporate strategy: from what type of goods and services they provide to how they interact with customers, recruit and develop talent and structure their organizations. Brainstorm Design is a unique new conference dedicated to exploring the increasingly crucial nexus between business and design. 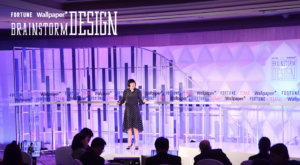 Held for the first time in 2018, the three-day event is the latest addition to Fortune’s influential Brainstorm conference series. Brainstorm Design combines the editorial wisdom of Fortune and Wallpaper* to deliver a lively and informative event that bringing together the Fortune 500’s most powerful executives and the world’s most talented designers. This year we are using our unique Total Prospect Management approach to tie together sales and marketing – putting delegate prospects at a unified suite of activity.